By 1934, Fontenot had begun performing with Amédé Ardoin, who wanted him to play on a recording session with him in New York; however, his parents would not allow him to travel. In the late 1930s, he formed a string band with George Lenard and Paul Frank, playing boogie woogie, western swing and jazz as well as traditional tunes, but after a few years Fontenot established a more lasting partnership with accordionist Alphonse "Bois Sec" Ardoin (a cousin of Amédé) from nearby Duralde. 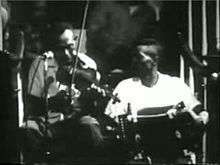 In 1948 the pair formed the Duralde Ramblers, who became highly popular in south west Louisiana and made many radio broadcasts through the 1950s, notably on KEUN in Eunice. He also began writing songs. His most well-known original songs are "Joe Pitre a Deux Femmes," "Les Barres de la prison" and "Bonsoir Moreau", which have become standards in the Cajun music and Zydeco music repertoires. Fontenot was never a professional musician; he was a rice farmer for many years, and also worked as a labourer in a feed store in the town of Welsh. He was awarded the NEA National Heritage Fellowship in 1986, in the same year as he and Ardoin were appointed adjunct professors at the University of Southwestern Louisiana. In later years he was featured in many documentaries on Cajun and Creole culture, including the 1989 film "J'ai Ete au Bal" as well as PBS's American Patchwork "Don't Drop the Potato". He also performed in New Orleans and toured Europe with the band Filé. There is a portrait of Canray in Yasha Aginsky's 1983 film "Cajun Visits," and in Jean-Pierre Bruneau's 1993 film "Louisiana Blues," edited by Yasha Aginsky. Canray's music can be found on Arhoolie Records, CD 381, "Canray Fontenot: Louisiana Hot Sauce, Creole Style", 1993; also on Arhoolie Records, "Les Blues de Bayou", 1970; and also on Arhoolie Records, "La Musique Creole", 1983. ↑ Savoy 1984, p. 329. 1 2 "Canray Fontenot". Archived from the original on 2007-09-28. 1 2 3 4 5 6 7 8 9 Harris, Paul (2008). "Biography of Canray Fontenot". Juke Blues (65). 1 2 Eagle, Bob; LeBlanc, Eric S. (2013). Blues - A Regional Experience. Santa Barbara: Praeger Publishers. p. 381. ISBN 978-0313344237. 1 2 "NEA National Heritage Fellowships: Canray Fontenot". Retrieved 2011-01-09. ↑ Eagle, Bob; LeBlanc, Eric S. (2013). Blues - A Regional Experience. Santa Barbara: Praeger Publishers. p. 314. ISBN 978-0313344237.